Place all the ingredients for the spice rub, except for the salt and lime, in a pan and heat gently over a low heat for 2 minutes, stirring constantly. Leave to cool and then grind with a pestle and mortar or a spice grinder. Weigh the lamb and calculate the cooking time (see Cooking time, above). Then score the fatty side of the lamb. Place the lamb in a roasting tin, bone side down. Mix the lime zest and sea salt into the ground spices and rub all over the lamb. Cover and leave to marinate for 1 hour in the fridge or chill overnight. Preheat the oven to 200°C, gas mark 6, then roast the lamb for the calculated time. About 25 minutes before the lamb is cooked, heat the oil in a large pan, add the leeks and red peppers, cover and cook gently over a medium heat, stirring occasionally for 12 minutes. Trim the asparagus into 7cm lengths, removing and discarding the coarse ends, and add to the leeks and peppers with the balsamic vinegar. Cook uncovered for 10-12 minutes, stirring frequently until most of the liquid has evaporated. Keep warm on a large serving platter. Once cooked, transfer the lamb racks to a carving board and allow to rest for 5 minutes loosely covered in foil. Add the lime juice to the lamb juices in the roasting tin and heat gently on the hob for 2-3 minutes. 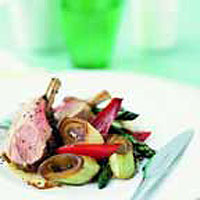 Carve the lamb into cutlets and arrange around the glazed vegetables, then drizzle over the pan juices and season. Sprinkle with parsley and serve immediately. If marinating overnight, allow the lamb to come to room temperature for 30 minutes before cooking.